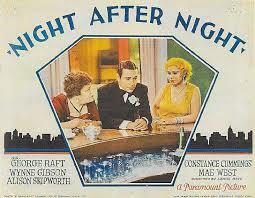 The other night I watched one of my favorite pre-Code films, Night after Night--this was Mae West's first film appearance, and although the screenplay was credited to Vincent Lawrence (with writing credits to Louis Bromfield and Katheryn Scoda), Mae West wrote much of her own dialogue (she is uncredited, however). Among the notable West-ian lines: when a young woman checking coats sees West's jewelry, she gushes, "Goodness, what beautiful diamonds!" The irrepressible West replies, "Goodness had nothing to do with it, dearie." Anyway, I love this film--not so much for the main story, with a gangster/speakeasy owner falling for "classy" socialite, but for West. The otherwise dull and predictable movie sparks to life when she is onscreen. But virtually all her scenes are shot with the amazing Alison Skipworth, who rarely gets much attention despite a long and very successful career. Born in London in 1863, Skipworth began her professional career as a stage actress in both London and New York before turning to film. She appeared in her first film in 1912 and moved to Hollywood in 1929. As a young woman, Skipworth was famed as a great beauty. When she began her acting career in 1894, Skipworth, then in her thirties, specialized in playing the role of grande dame, a socially prominent and haughty figure (though Skipworth herself was the daughter of a physician). The plays in which she acted were not very successful--at one point Skipworth claimed that she'd been in twenty-one flops between 1925 and 1930. Film offered her new opportunities--now no longer a young beauty, she took character roles, plump, often ridiculous "aristocratic" types, a series of dowagers and matrons like Emily La Rue in If I Had a Million (1932), where she was paired with W. C. Fields, and Tillie Winterbottom in Tillie and Gus (1933), again a foil to Fields and his role as Augustus Winterbottom. Her last film was made in 1938, when she was 75, though she continued to act on Broadway into the early 1940s. Skipworth died in 1952, just a few weeks before her 89th birthday. My favorite Skipworth performance is in this film, where she is Miss Mabel Jellyman, hired by George Raft's gangster to give him lessons in "class," including proper etiquette and speaking. But once she meets Mae West's Maudie Triplett. Miss Jellyman is only too happy to laugh at Maudie's double entendres, get drunk with her, and, ultimately, go into business with her--even though she assumes Maudie's "business" is keeping a brothel (Maudie denies this, insisting she runs a beauty shop). My favorite scene: when the two wake up in bed together after a night out. Now that's a double entendre! !